So I knew this would be a fun place to work. I also got to go out with the entire Gitomer clan for his daughter’s birthday. They shoehorned a dozen of us – three generations – into a table at the local Olive Garden. The Gitomer folks have a lot of fun and a lot of heart (and obviously work very hard). A few weeks later we nailed down the details and I’m happy to announce I’m joining the Gitomer team in 2 weeks. And we’re moving (again)! We are moving to Charlotte, North Carolina! Everyone we talk to keeps telling us how awesome the city is. We’ve got our sights set on a couple possibilities for apartments and Ron’s already chosen our future car. He’s going to try and re-domicile to work out of Chicago (he works for the airlines). We’ve already started to grow out our hair so we can have bouffants at our cotillions. Fortunately since we’ve moved apartments four times in the past 2 years we still have all of our boxes. So we’ve gotta find a mover to move our stuff across the country and then we’ll probably pack the cats and hard drives for a flight. I start in 2 weeks but we don’t move until mid-April so I’ve got some time to work on logistics. I will miss you two terribly and stalk you relentlessly. Wow Andy, that is exciting news! I can’t wait to see what you do next. You’re such a hireable guy, it’s no wonder you’re leaving one group of talented people for another. Congratulations on your new direction! CONGRATS! Good luck to you, Andy. Like a cat, you always seem to land on your feet. Enjoy Charlotte! We will miss you so much Andy! Thank you for bringing a smile to my day, everyday and saving my bacon on tech questions I couldn’t answer!! It has been so fun working with you. I hope you and Ron will be happy in Charlotte – promise you’ll come back and visit us. Welcome to the team Andy!! Congrats! nice to have another Yankee come South. If you ever find yourself in Hot’Atlanta please let me know. Congratulations, Andy! Welcome to NC!! Sweet tea and grits won’t disappoint. Charlotte ain’t San Francisco, but it’s a pretty cool city. I’m in Chapel Hill, just a couple of hours away. Good luck with your move and your new adventure. Congrats Andy! 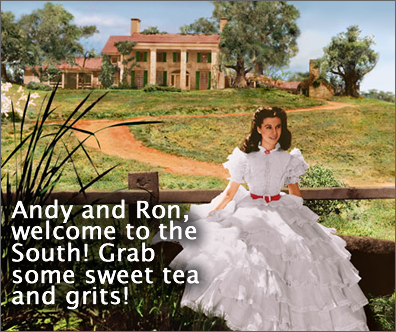 Welcome to the South y’all…maybe we can catch up when you and Ron move. Atlanta is an awesome city for a visit. This is great news!j I can’t wait to collaborate on projects in the near future. Before you get here you may want to check out Social Media Charlotte (http://www.socialmediacharlotte.com/) and sign up! This group has been great for info and socialization in the area. WELCOME ABOARD! Congratulations Andy! Wonderful things ahead for you! All the very best! Andy you are easy to rave about and I am glad Jeffrey Gitomer wrote That first Little Red Book ….it is amazing the learning that I digest from afar and what a fantastic new adventure. Enjoy! I love all of Gitomer’s little books – you’re in great company. Ears perked – and eyes peeled for the next book that has your touch. Welcome to North Carolina!! I live about an hour or so north of Charlotte – in the foothills. NC is a beautiful state and I’m sure you’ll like Charlotte. Lots of cool stuff to do! Congrats Andy! Oddly enough I just bought my first J. Gitomer book a couple of weeks ago: The Sales Bible. Upon reading the first few pages I felt like I had been inaugurated into a club where the only people allowed are really smart AND funny AND uber successful at bringing their message to the world in a profitable way. Sales really does look delicious when you adopt Gitomer’s paradigm. What a fascinating yet fitting combination – Wibbels and Gitomer, Rock On! When I first went looking for your book, I had the same experience. That little red book with the red ribbon caught my eye. I bought your book and Jeffrey’s. I have since bought all of his books and they are all brilliant and fun to read as was yours. Looks like a great match. All the luck in the world to you and Ron. What wonderful news — sounds like the perfect place and job for you. Congrats and all that…watch “Midnight in the Garden of Good and Evil” and start working on your mint juleps to get in a southern state of mind! Hey Andy – Congrats on this move! My wife is awaiting decision for grad school in Boone, NC (Appalachian State U, for arts therapy) 2 hours from Charlotte. We’ve already met lots of great people from the state. I’m a filmmaker and marketing consultant/blogger myself, so nice to know about other like-minded folks…. Sounds like a great opportunity – and it’s certainly a beautiful area. Enjoy it! And find some good shrimp and grits. This entry was posted in General on January 27, 2010 by Andy Wibbels.